It has been so ridiculously cold this winter, I cannot stand it! It’s Wednesday night and all anyone can talk about is the upcoming snow storm we’re expecting. It’s supposed to last all night and into tomorrow, ending in the evening on Thursday. I’m just over it! 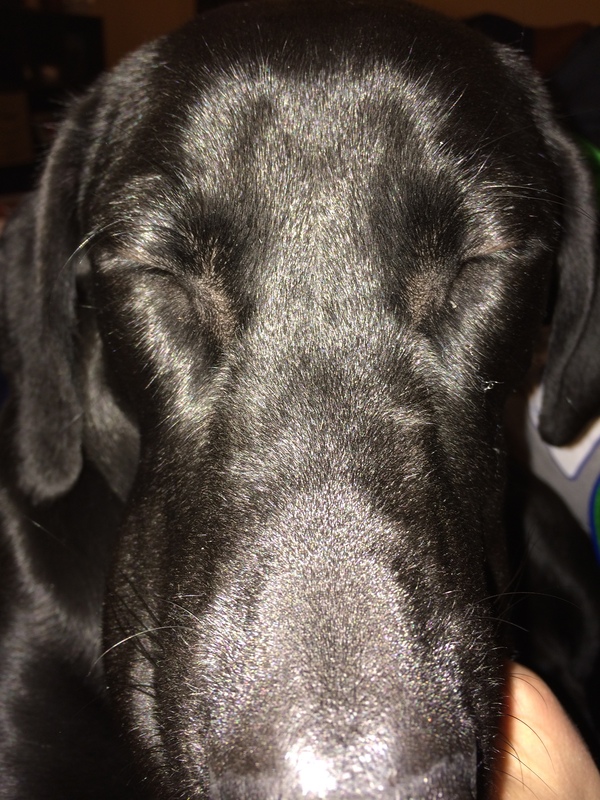 It’s all over the news, twitter and facebook… shut up people! Let’s talk about how the Phillies started Spring Training today!! Snoop can show you exactly how I feel! All I keep thinking about is how badly I wish I had another pineapple to make this dessert again. But I don’t have one… and it’s already snowing. BOO! 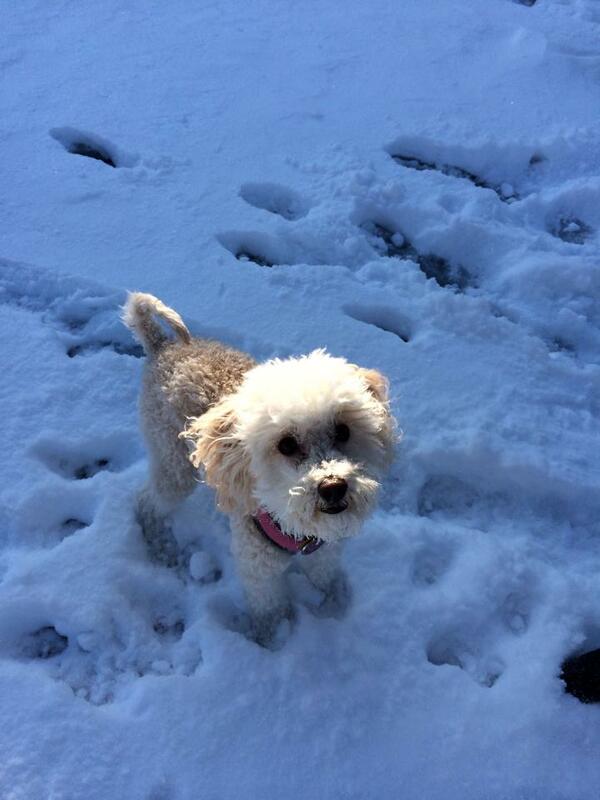 Stelly loves the snow! The doggies are so excited. 1. Preheat oven to 450. Line a large rimmed baking sheet with parchment paper. * Stir the brown sugar, OJ, and honey in a large bowl until sugar dissolves. Add pineapple and carefully toss to coat in the mixture. Let marinate, tossing occasionally for about 10 minutes. 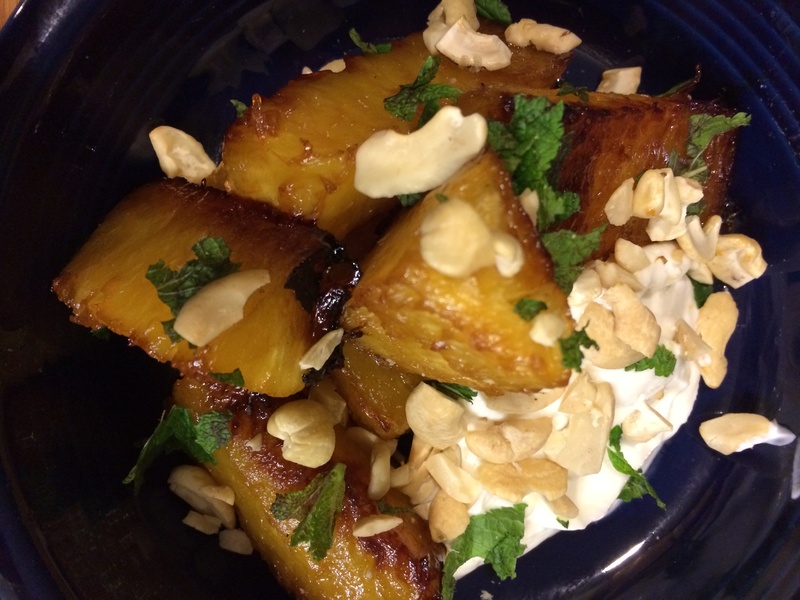 Place pineapple on the prepared sheet and reserve the marinade. 2. Roast the pineapple for 15 minutes. 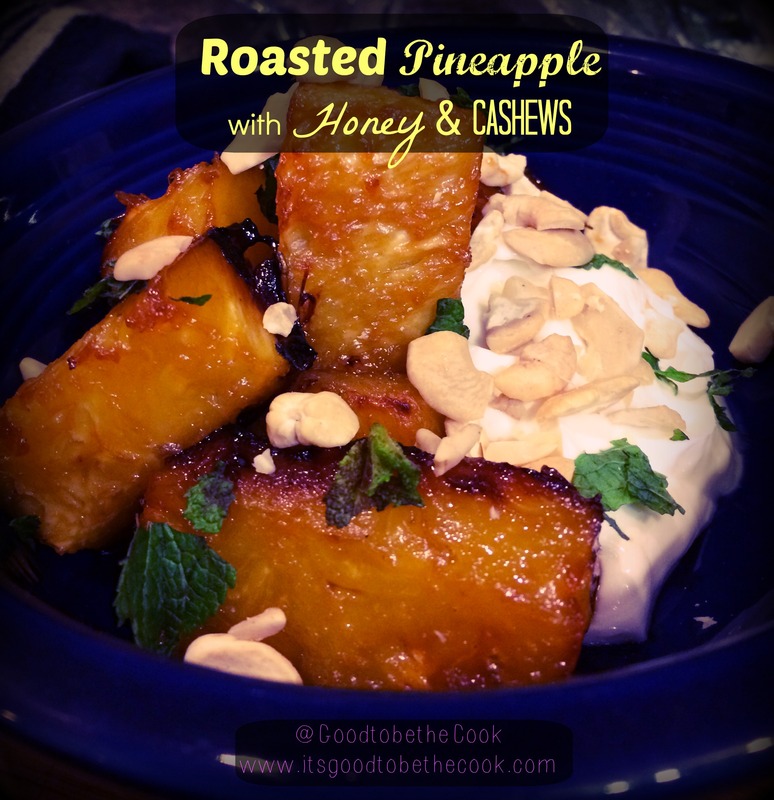 Turn, brush with marinade, and roast until tender and caramelized (10-15 minutes longer) Drizzle remaining marinade over the pineapple and let cool slightly. 3. Divide pinapple among bowls (Dave and I ate the entire thing ourselves!!). Spoon greek yogurt alongside. Garnish with cashews and mint. *Make sure to line the entire pan! The marinade is very liquidy and mine leaked all over the pan- it was a tough one to scrub off when I was finished. What’s so funny about this recipe is that I originally posted the Bon Appetit version on my facebook so I would remember to try it! Dave’s Mom thought it was mine and re-posted on her own wall showing me off! I was happy to have all the love but that was enough inspiration for me to make it myself. It’s probably the best dessert I’ve ever had. After the Banana Cream Pie at Chef Vola’s. The original recipe uses pistachios, but Dave loves cashews and I had ’em so i used those instead. Also, you can swap out the greek yogurt for some creme fraiche if you’re feeling fancy. Whatever you do- don’t skimp out on the fresh mint. Seriously. It’s like a dollar at the grocery store and you can use the rest in tea and in recipes like this (I made it last week and holy moly it’s amazing). While every single part of this dessert has its own perks… the mint… oh my gosh…. the mint. It just makes this dish. I don’t know why but it just does and it’s SO GOOD. Anyway, this is a super easy dessert that will seriously impress people, so give it a try. I can’t wait to make it again! The POMEGRANATE holds a dear place in my heart. In Judiasm, this seedy red fruit symbolizes fruitfulness and fertility. It is a symbol and a fruit that was very prominent in our trip to Israel. We came across many vendors selling cupfuls of fresh pom juice and enjoyed it throughout the trip. I even purchased a small piece of art that’s shaped like a pomegranate! 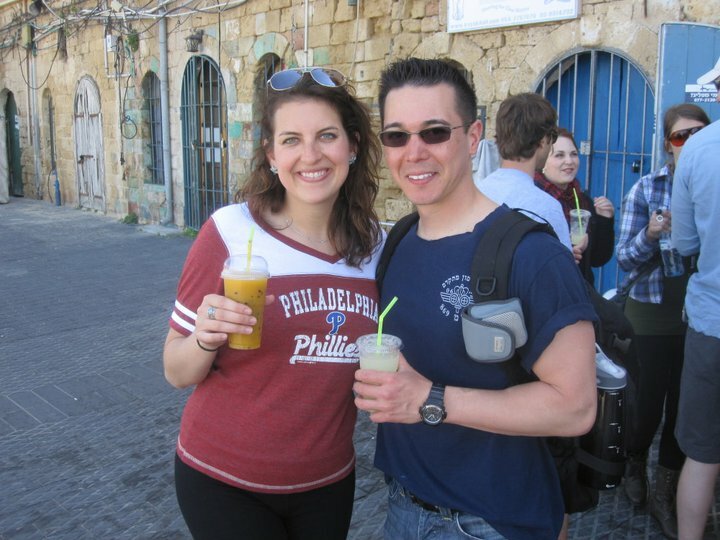 The pom juice in Israel was amazing! It was only like $3 too… could you imagine getting a 16oz of fresh pom juice here for $3?! When we arrived home from Israel, I was determined to find one of these contraptions we saw in Israel that allowed the vendors to make the pom juice so quick. I didn’t have such luck and could only find industrial juicers that were way too expensive. About a year later, our friend Donny remembered my quest and bought us one as our housewarming gift. It’s awesome! 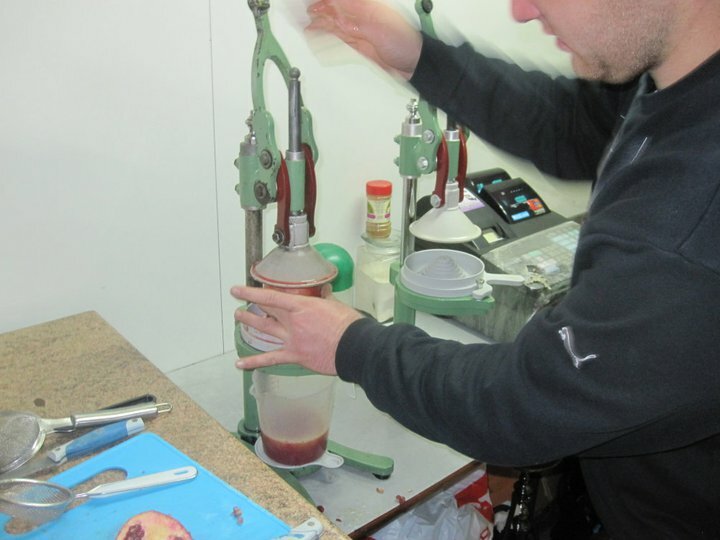 We use it to juice both poms and oranges… very cool! Anyway, the pomegranate shows up in a few recipes during the Bon Appetit Cleanse, which I just love. This breakfast recipe is something I had never tried before and it was a huge success. 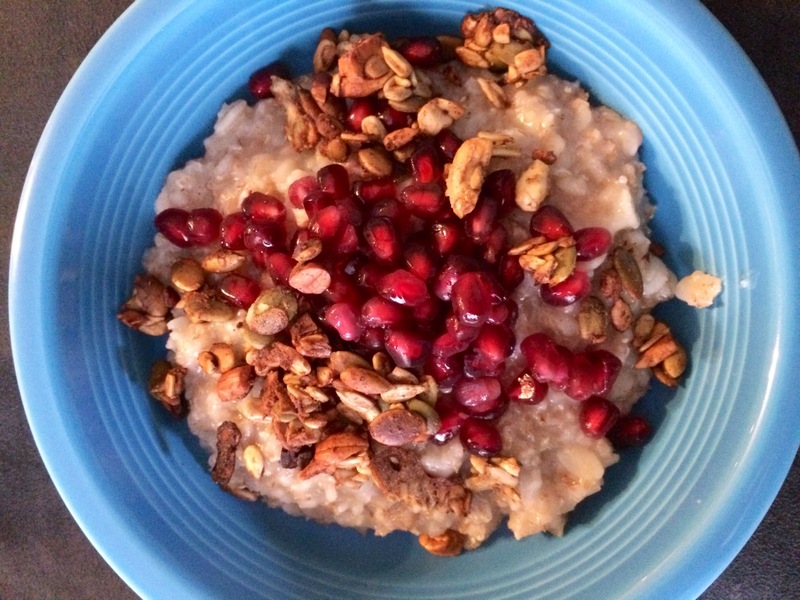 I’ve made the multigrain hot cereal before with bananas, but the pomegranates offer that crunch and a bit of sour flavor to make it interesting. Prepare multigrain cereal according to package directions (boil in a pot with water, stirring occasionally). Top with pomegranate seeds and Spiced Pepita and Cashew Crunch; drizzle with nut or soy milk. I was super psyched to share a new brekfast recipe with you. I normally have plain Kashi cereal, greek yogurt, or some egg whites for breakfast… not really anything to write home about! 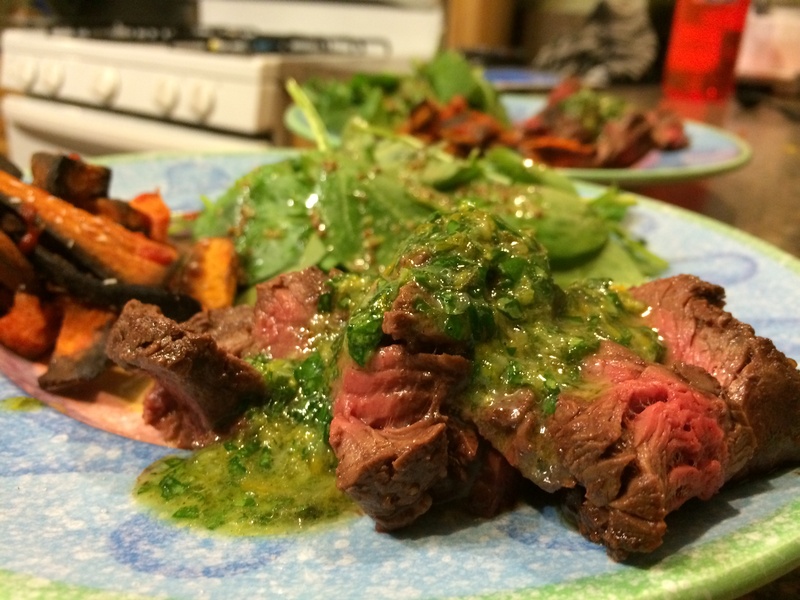 That’s what is so great about the cleanse… it forced me to try new recipes for EVERY meal, not just dinner! 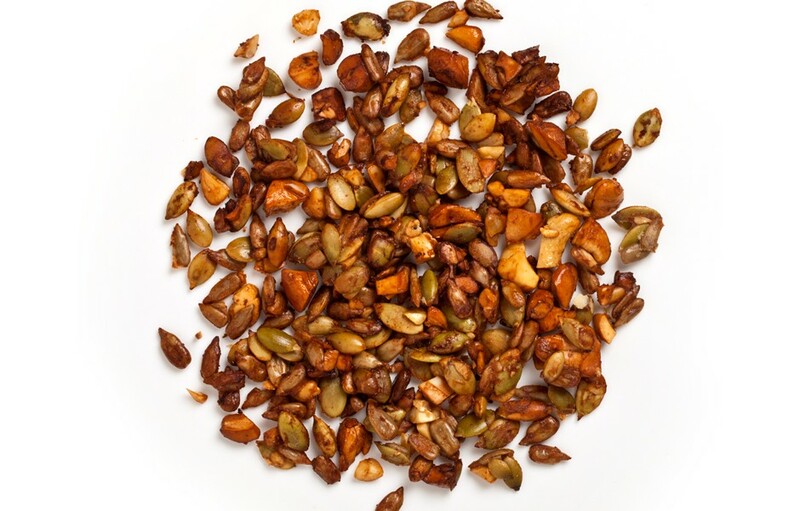 The Pepita Crunch in this recipe I absolutely love. I have used it on so many recipes so far. I even wrote about it on the blog already! Make sure you have this made in advance so breakfast is easy in the morning. What’s your favorite healthy breakfast? Try these! ​​What’s funny about this recipe is that the inspiration came from a Bon Appetit article called “12 Ways to Cook w/ Ricotta“. I bookmarked this pasta dish along with the hundreds of other recipes I save. 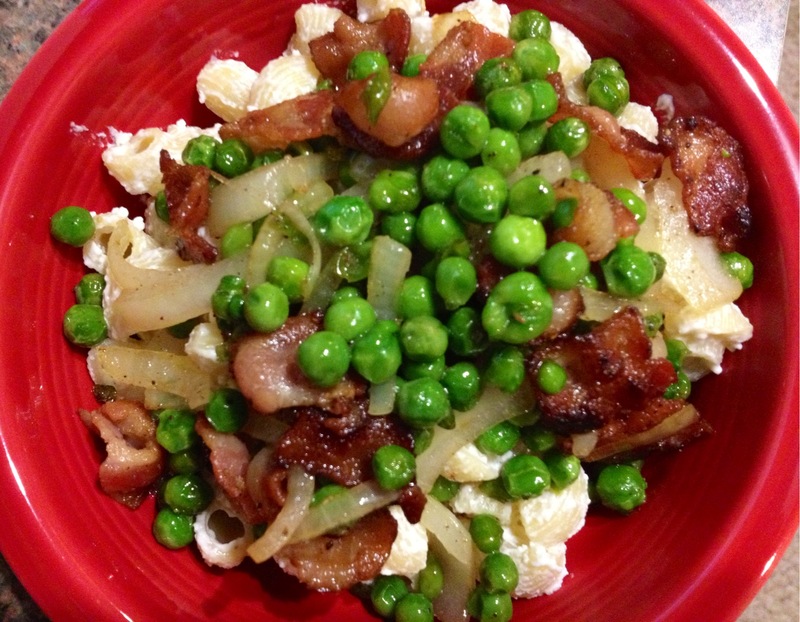 The other day, it caught my eye and I decided to make this for dinner but whoops… I had no Ricotta! I improvised and ended up with a really yummy pasta without the starring ingredient. 1. 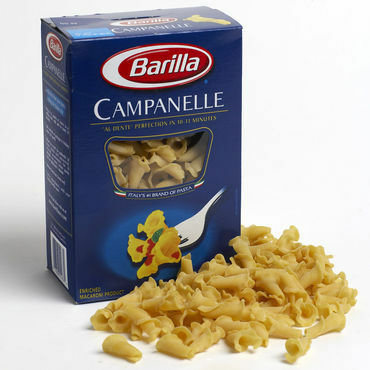 Cook pasta in salted water to al dente according to the directions on the package. Drain and set aside. 2. Meanwhile, cook the chopped bacon, stirring occasionally until it starts to crisp up. Add the sliced onion and cook, still stirring until the onions are softening up a bit. 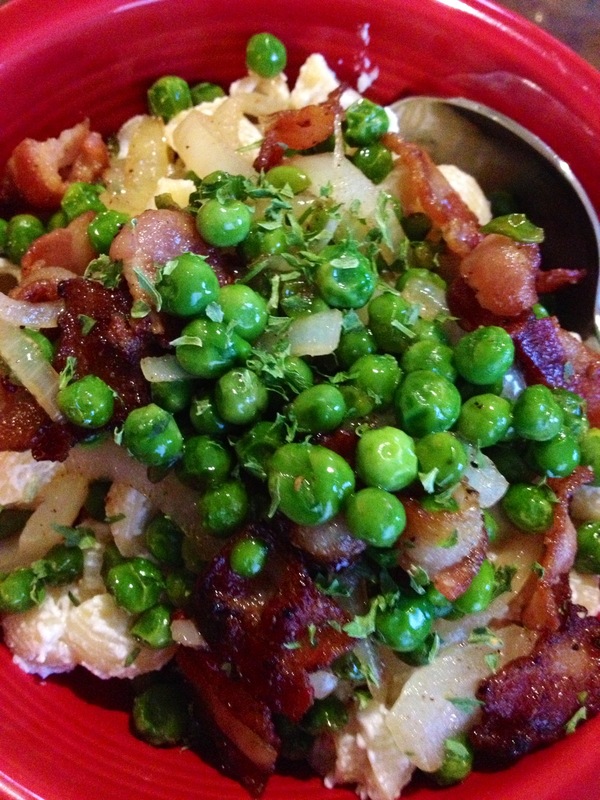 Add the frozen peas and continue to cook making sure you don’t burn the bacon. 3. Melt the cream cheese, sour cream, greek yogurt, and most of the parmesan cheese over the drained and hot pasta. Stir to combine. 4. 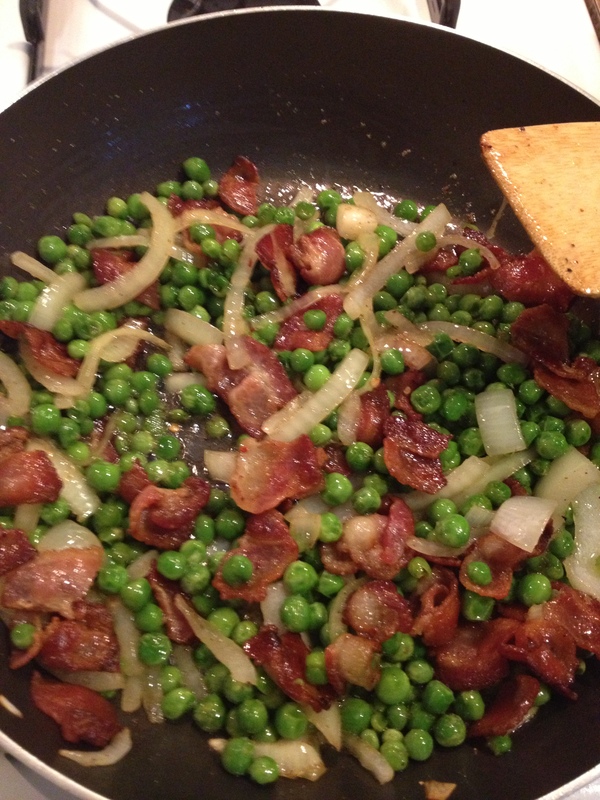 Once the peas are heated through and the bacon is cooked crisp to your liking, pour the mixture over the sauced-up pasta. Sprinkle with black pepper and parsley. Enjoy! If you cut the bacon into this size, it will shrink up nicely but still maintain a large enough piece to really notice it in your dish! Woo-Wee! This recipe is so yummy! I have to appreciate the rare occasion where I am allowed to eat bacon for dinner. Both Dave and I devoured our portions and I had to be careful we didn’t over eat since this wasn’t the healthiest meal! While I assume making this dish with ricotta cheese would be delicious, I didn’t miss it at all. The rich bacon grease drippings mixed with the creaminess of the pasta sauce was more than enough flavor to make this recipe spectacular. It might sound strange, but try it! It just works. Oh, and i left the salt out on purpose, you totally don’t need it when there’s bacon involved!! 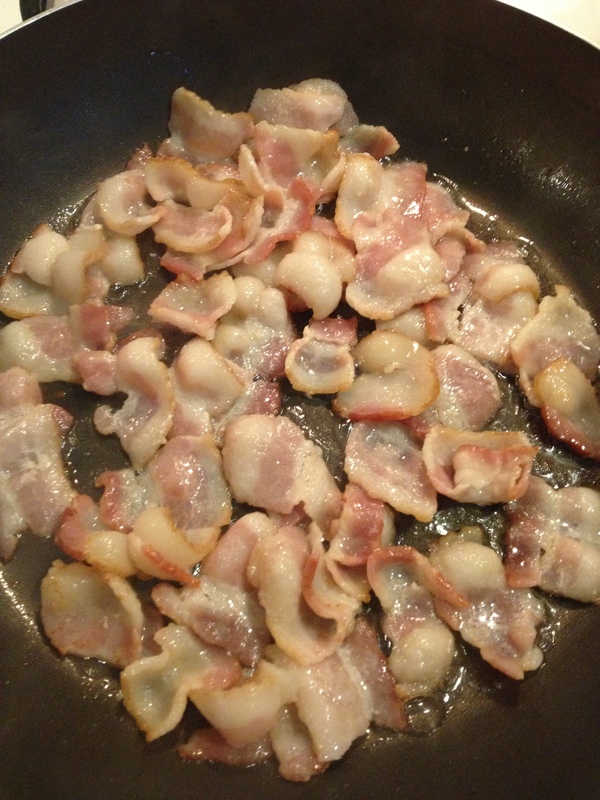 Check out some of my other BACON recipes! I was looking for an easy but delicious recipe that would be good to make for four instead of my typical two. I had friends over for dinner… friends who love food like I do… so something boring or ordering pizza was not gonna happen. After about an hour of searching through my saved recipes on the internet, I remembered a really super simple recipe I saw in a Bon Appetit recently that I thought would be perfect: “New” Chicken Parm. I recalled that the chicken was not fried and then cooked in sauce, resulting in a healthier chicken parm… AND a potentially sauce-free dish for one of my guests who doesn’t like sauce (he’s crazy, right?). Those two points sold me, and have the potential to give this dish a permanent spot in my repertoire. I love finding classic comfort food recipes with new twists and tricks to make them healthier. 1. Preheat the oven to 500. Whisk the oil, garlic, salt, pepper, and italian seasoning mix into a large bowl. Dump the tomatoes into the bowl and stir to coat the tomatoes with the oil mixture. Remove the tomatoes reserving the oil mixture, spreading the tomatoes out onto a foil-covered baking sheet and put in the oven and bake for about 20 minutes, stirring about halfway through. Remove them once they are starting to brown. 2. Prepare a large baking dish with cooking spray. Combine 1/2 cup parmesan cheese and the bread crumbs onto a plate. Place a chicken breast into the garlic-oil bowl and mix around. Let drip off and then dredge into the bread crumb-parm mixture. Coat completely, then carefully place in the baking dish. Do this for every piece of chicken breast. Your tomatoes should be done by now too- remove them and place aside. 3. Cook chicken for about 8-12 minutes, then remove the baking dish to sprinkle on the crushed red pepper, 1/4 cup Parmesan, and 1 cup Mozzarella. (I kept my cheese on the lighter side). Place back in the oven and cook until the chicken is done (firm to touch), about 2-3 more minutes depending on thickness. If the cheese is starting to cook too fast, place aluminum foil on top. 4. 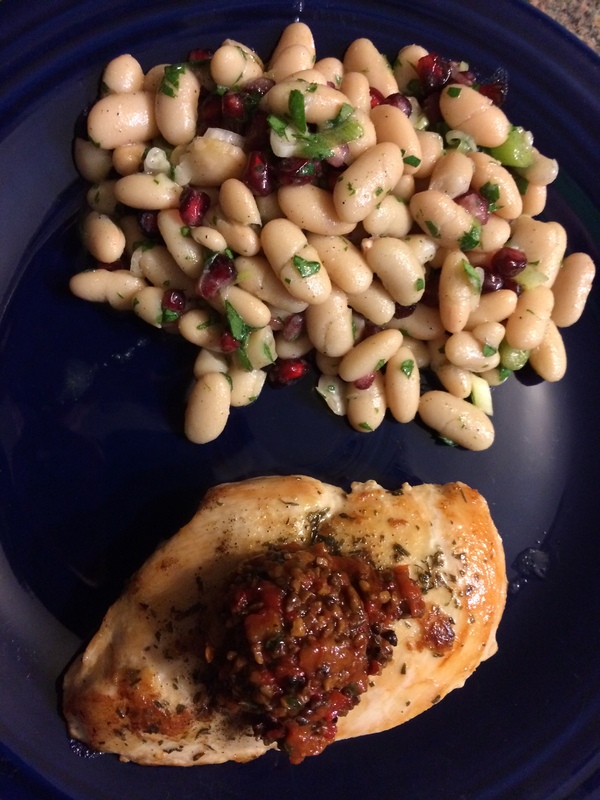 Remove the chicken and plate with a side of tomato sauce, the roasted tomatoes, and fresh basil. 1. Chicken is dredged in flavored olive oil (and not a lot of it) instead of egg. The bread crumbs still stuck on really nicely. It made the chicken light and crispy. 2. The chicken is not fried like in most Chicken Parmesan recipes. 3. Tomato Sauce is not added on in the baking process, preventing the chicken from getting soggy. 4. Roasted tomatoes. Nom nom nom. I served the “new” Chicken Parm with a side of whole wheat Spaghetti, sauteed Green Beans, and a sliced baguette with spiced olive oil & Whipped Ricotta. The four of us had one seriously tasty feast! Chicken has baked once and is now cheesed- ready to go back in for a nice melt. 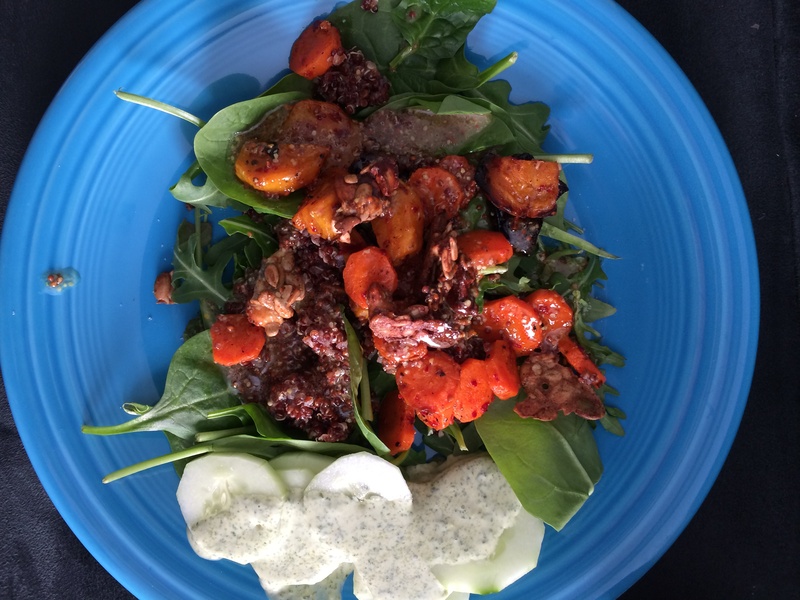 Here’s that amazing Whipped Feta with a few roasted tomatoes ontop… click for the recipe! Closeup of one delicious meal.